Would liberals favoring Clinton over Sanders in 2016 have rooted for Lincoln’s opponent in 1858? My colleague Corey Robin wrote a column earlier this week on the fallacies and forgetfulness of liberal Democrats who continue to favor Hillary Clinton for the party’s Presidential nominee. At this point the liberal Democrat case for Clinton essentially comes down to the (dubious) notion that she’s the more electable Democrat, and better equipped to deliver if elected. Bernie Sanders may be the bona fide liberal in the race – no argument there – but Clinton is the one with the undisputed national stature, the impressive record of accomplishment, and the proven political skill – to say nothing of her better aptitude for tailoring her message for mainstream appeal. As Corey makes clear, to argue this way is to stake the Democrats’ hopes on the glamour of Clinton’s success, her talent for positioning herself as her party’s quasi-official front-runner. Reading Corey’s column— which I recommend to anyone still in the grip of this way of thinking— I got to thinking about certain parallels with a past election I’ve lately been doing some reading about. There’s a peculiar resemblance between the liberal case for supporting Clinton this year, and the case that was made by anti-slavery Republicans for supporting Stephen Douglas in the Senate election of 1858 — against Abraham Lincoln. I mentioned this to Corey; he mentioned it on his blog. So let me just fill out the thought with a bit of historical context, and some choice words of Lincoln’s on the subject. The 1858 Illinois Senate race is remembered mainly for the series of seven debates between Lincoln and Douglas, held in towns across the state from August through October that year. (There were no debates when they vied for the Presidency two years later.) If what you know of that election is the Lincoln-Douglas debates, it might sound strange that any anti-slavery men could have favored Douglas over Lincoln. Lincoln had staked his career on fighting the slave-holding powers’ ascendancy, making that the central, single issue of his campaign. Douglas, the incumbent, had long made it his policy to take no position on whether slavery was right or wrong. Lincoln hammered away at that in their debates, mocking Douglas as the only man in the country without an opinion on the issue. Surely any sincere opponent of slavery would recognize which of the two was a friend of their cause. And surely the challenger’s scrappy persistence in pressing the issue in every debate would rally all sound anti-slavery men to his side. Only it wasn’t so simple as that. Or at any rate — and more to the point — there were plenty of people on the scene at the time who persuaded themselves that it wasn’t. This was 1858, a moment when Lincoln’s Republican Party was still a recent, geographically-limited proposition, and Douglas’ Democratic Party was increasingly split between North and South. The Republicans embraced not only ex-Whigs like Lincoln, but also many Democrats, repelled by their former party’s increasingly southward tilt. That included Illinois’ other U.S. Senator, Lyman Trumbull, who had still been a Democrat when elected. Senator Trumbull’s senior colleague Douglas was a figure of national stature, the Northern Democrats’ headstrong and capable leader on Capitol Hill. He had put enough distance between himself and his party’s hardline pro-slavery wing for Establishment Republicans in Washington and New York to see him as practically — well, potentially — a friend of their cause. 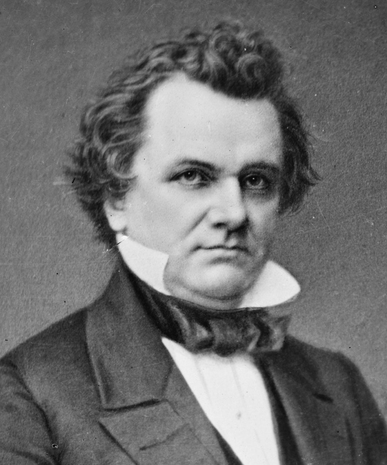 Douglas had recently broken with his party’s incumbent President, James Buchanan, over the latter’s heavy-handed attempt to bring Kansas into the Union as a slave-holding state. (The dispute concerned the validity of the Kansas constitution voted by a slave-holders’ meeting in the town of Lecompton, without proper ratification by the territory’s settlers.) Douglas had also made it known he opposed a repeal of the longstanding ban on the foreign importation of slaves. Lincoln derided this as a hollow, inconsequential gesture, without any real bite. But there were Republican regulars at the time who wanted the party to embrace that very position as an acceptably ‘moderate’ anti-slavery stance, better suited for furthering their party’s national prospects than Lincoln’s pricklier confrontation with slaveholders’ vested interests. Within Illinois, Republican strategists had argued that party would be better served by endorsing Douglas’ re-election than by backing a candidate of their own. Lincoln won that argument, obtaining the party’s nomination. But that wasn’t enough to keep prominent Republicans back East from throwing their vocal support to Douglas. Among them was Horace Greeley, the influential editor of the New-York Tribune. Greeley was so given to “eulogising, and admiring, and magnifying of Douglas” (as Lincoln complained, in a letter to Lyman Trumbull) that some in Lincoln’s circle wondered if the two had struck some sort of secret deal. The problem wasn’t merely that Douglas couldn’t be counted upon to put his great talent at the service of a cause to which he had never been committed. A talent like his was no use in the the fight, for it largely consisted in his gift for sidestepping the issue. His reputation had been won through a career of obscuring and belittling the principle involved.